Some additional basics of garden design to think about when planning and designing your garden areas are listed here for your consideration. You might wonder why personal taste would be part of a well designed garden. You'll have things to consider like ... Do you like perennials over annuals? Would you prefer a shaded garden to a full sun garden? What about ornamental grass ... do you want any or do you prefer all flowers in your garden? 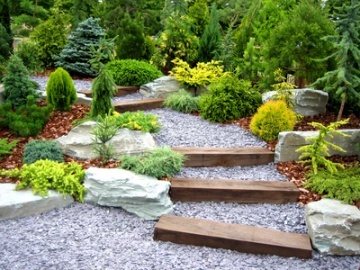 Your personal tastes will play a big part in what goes into your garden design. Which part of your garden area will you be able to see most often? Make it the focal point where you place that special plant or flower you'll enjoy the most. After all, a large part of gardening is personal enjoyment. If you can see the focal point often, you'll get more pleasure from it every time you see it in your garden area. An item that greatly impacts your garden areas is color. Anyone can learn to beautifully combine color in their flower garden with a little help from the color wheel and some easy to remember tips on how to use it. Take into consideration the overall size of your garden. Are you working with a 3' x 3' area or something larger? Be sure that in your planning sketch that you allow enough space for the full size of your flowers and plants when they are grown and mature. Remember, also, that by using size in a variety of plant and flower heights and widths in your garden area, you'll be creating additional eye-appeal and interest. Be sure to space flowers and plants evenly around your garden area. A patch of flowers here and a bare spot there will tend to give your garden an unbalanced feel overall. Remember that you could use a gardening accent rather than a flower or plant to fill in that bare spot, too. Keep in mind that it is your personal tastes that will govern your garden areas overall. Take a moment or two to draw up a quick sketch of how you want the area to look when the flowers and plants are in the ground. Then once you decide which flower or plant will be the focal point of your garden, beautifully combine colors around it remembering to add a variety of plants with differing heights and widths. Consideration of these additional basics of garden design will have you creating your very own garden designs quick 'n easy!